The growth of research on general relativity in Germany from its origin in 1915 to the beginning of the 1990s is described. A gradual evolution from research done by single physicists and mathematicians to the eventual institutionalizion in the form of a research institute and subdivision of physical society is brought into focus. Tilman Sauer “Marcel Grossmann and his contribution to the general theory of relativity”. http://arxiv.org/pdf/1312.4068v2.pdf (2013/14). Helge Kragh. “Eight Physicists and Astronomers: Biographical Portraits”. arXiv:1208.3114v1 [physics.hist-ph] Contributions to Thomas Hockey et al., eds., The Biographical Encyclopedia of Astronomers. New York: Springer (2007). Hubert Goenner, “A Golden Age of General Relativity? Some remarks on the history of general relativity”. Relativity and Gravitation 49 Nr. 3, online March 2017. arXiv:1607.03319 (2016). Tilman Sauer, “The Einstein-Mathisson correspondence”. 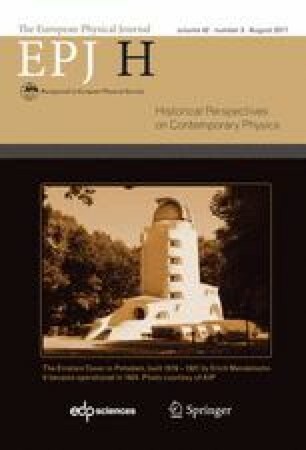 Albert Einstein Archives and Einstein Papers Project http://www.fuw.edu.pl/˜krp/mathisson/wyklady/AE-MM.pdf (2007). T. Sauer and A. Trautman, “Myron Mathisson: what little we know about his life”. arXiv:0802.2971 (2008). Movie of the Round-Table-Talk at the Conference on Youtube, http://nsm.utdallas.edu/texas2013/events/ – assessed August 2015. Hubert Goenner, “Some remarks on the early history of the Albert Einstein Institute”. Lecture given at the workshop “Opening new windows on the cosmos: Astrophysics and Astronomy in the History of the Max Planck Society”, Berlin 6–8 Sept. 2016. arXiv:1612.01338 [physics.hist-ph].